Bronze follis, 22mm, 6.58gm, issued AD 308-310. Ticinum mint. Obv: IMP MAXENTIVS PF AVG, Laureate head facing right. Rev: CONSERV VRB SVAE (TT in ex. 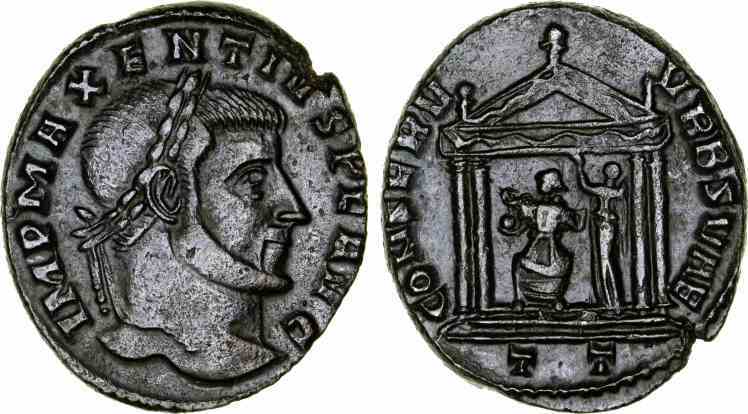 ), Roma seated crowned by Victory within tetrastyle temple. References: Sear 14995, RIC 108.